Hour 2: What does it take to find and photograph some of the most elusive animals on the planet? We’ll spend this hour with Tim Laman, a field biologist and wildlife photographer from Harvard’s Museum of Comparative Zoology and Edwin Scholes, an ornithologist and biodiversity video curator at the Cornell Lab of Ornithology. 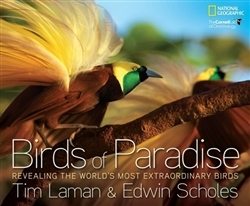 For nearly a decade they’ve collaborated on a project to photograph all 39 species of New Guinea’s birds-of-paradise and they’ll talk about their work tonight as part of National Geographic Live! at the AT&T Performing Arts Center. Find tickets here.